Created for Vietnamese English Language Learners, this EFL textbook includes thematic chapters to create quality conversations and uses conversation starters, interview questions, classic quotations, and proverbs for hours of class discussions. 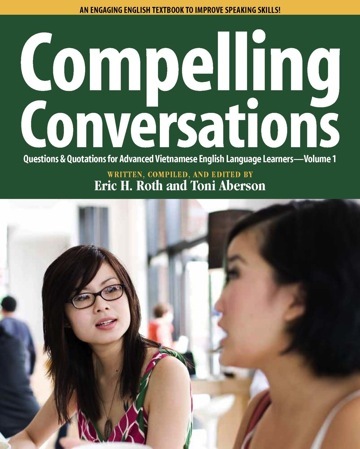 "Compelling Conversations: Questions and Quotations for Advanced Vietnamese English Language Learners" (Chimayo Press) is a culturally sensitive EFL text encourages students to speak about their experiences, their families, and their lives in 15 engaging chapters. With dozens of practical speaking exercises, "Compelling Conversations" helps advanced Vietnamese English Language Learners develop greater fluency, develop and express their opinions, give reasons to support their opinions, build critical thinking skills, prepare for standardized tests with speaking sections (TOEFL, IELTS), and create authentic conversations. Can also be used to teach English abroad in English as a Foreign Language classes (EFL). Recommended in "The Electronic Journal for English as a Second Language."